“You are so strong.” I don’t know how many times I’ve heard this statement over the past 6 years. While a part of me loves to hear it and part of me feels strong, I know I could not have done any of this on my own. The strength I have does not come from me; it comes from within me, from God living in me. A few months ago I watched a video with my favorite radio show host. He was interviewing a Christian musician. I don’t remember most of the interview, but I the one thing I do remember really hit home. 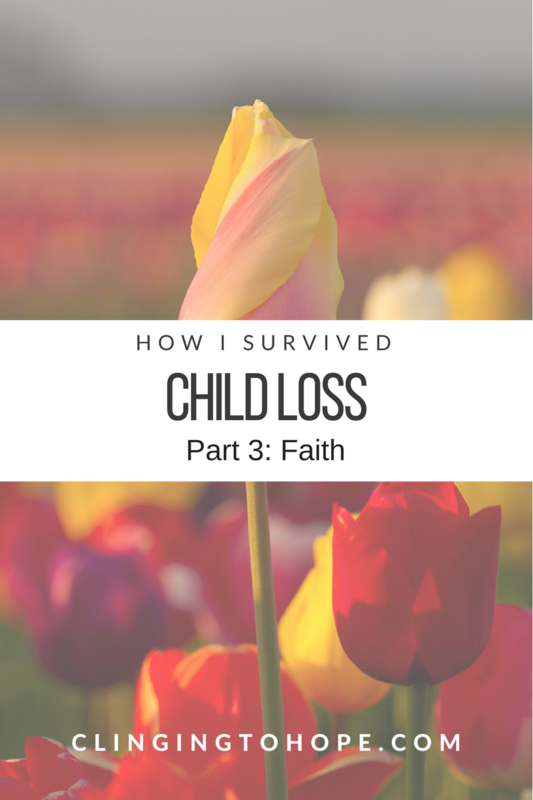 He said, in the wake of a personal trauma, his grief over the situation, kept crashing up against something solid inside him – his faith in God. When I heard that, I knew exactly what he meant. I’d felt the same thing in my own life. Every time the intense pain of grief washed over me, I turned to God. I’d cry out “help me”. They were the only words I could utter. I’d ugly cry in God’s presence because I couldn’t do it alone. 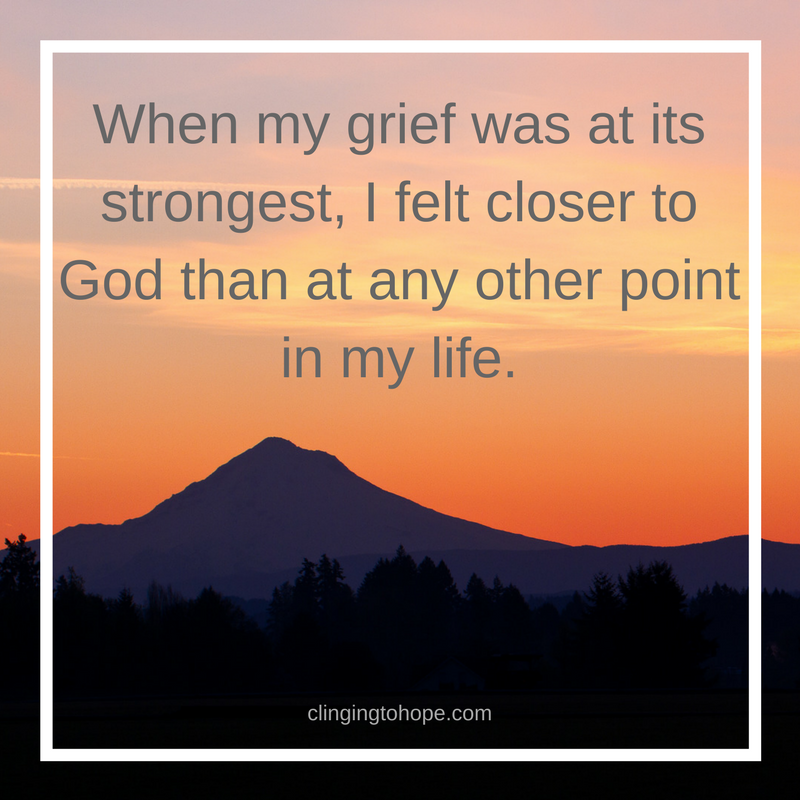 Through this process a strange thing happened, I realized when my grief was at its strongest I felt closer to God than at any other point in my life. When I turned to God in the middle of my pain, he was there for me. Every. Single. Time. Sometimes I could hear him talk to me. Others I just knew he was there. One afternoon, I was on the floor of my boy’s bedroom crying out to God my desperate “help me” plea. I was feeling very alone that particular day. Later that afternoon I received messages from 3 different people who didn’t know each other but knew me. Each message was a variation of “I’m thinking of you and praying for you”. I was overwhelmed and in that moment I knew God had heard my prayer of tears and was letting me know he was with me. 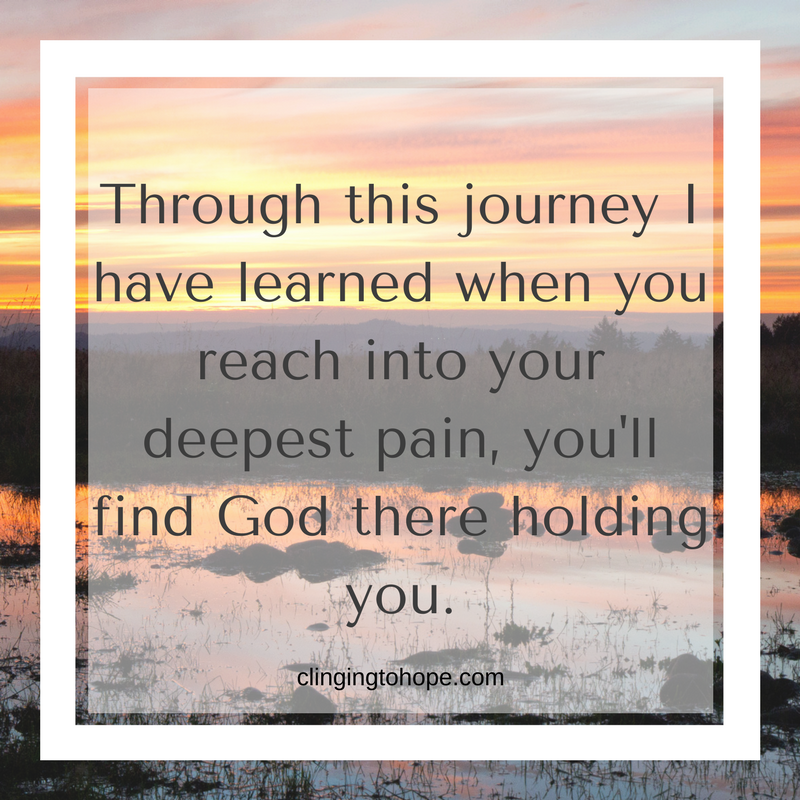 Through this journey I have learned when you reach into your deepest pain, you’ll find God there holding you. Sunday mornings became a time of meeting God on a whole new level. I would go to church and hide in the balcony. I would sing the worship songs and cry through the whole thing. 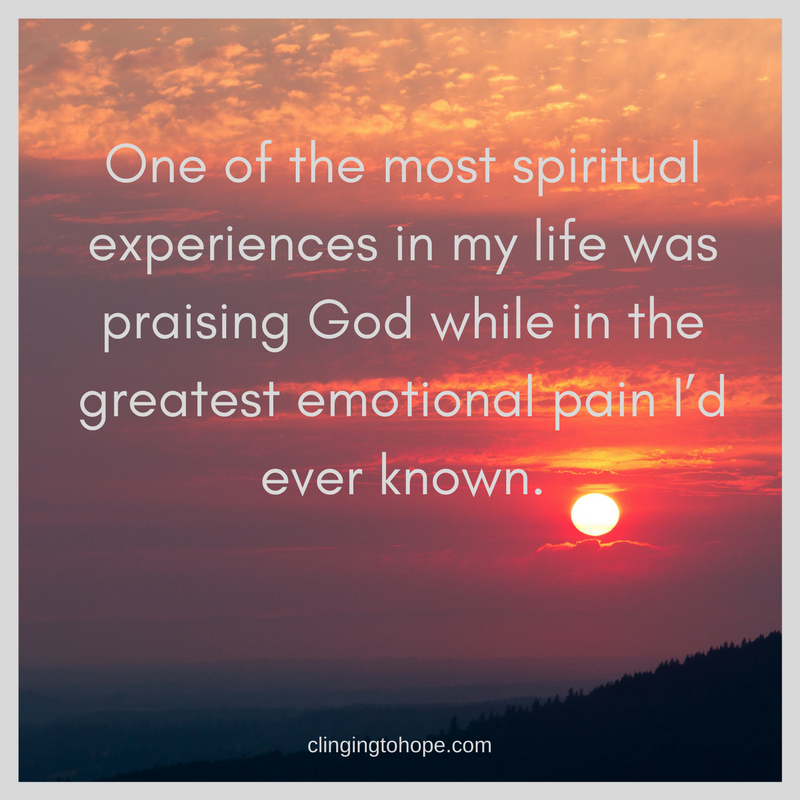 One of the most spiritual experiences in my life was praising God while in the greatest emotional pain I’d ever known. I wish I could accurately describe what it was like. It’s the closest I’ve ever felt to God. I could almost see him. I felt like he was reaching down and gently pulling my pain to himself. Pain, relief, praise and comfort it was such an interesting mix of emotions. But it gave me the strength I needed to face the day. There are so many ways God has given me strength to travel this journey. My first thoughts after the accident were of God (you can read about it here). He provided me an amazing support system that has prayed for me and carried me through (read here). He’s been there in my pain and held me when I cried. All my tears of grief have been spent in God’s presence. I don’t know how people travel through this cruel world without God. And I don’t know how people get through child loss without Him to lean on. I would not be here today, if not for the hope and strength God has given me. I could not have made it this far without God. Left to my own devices I would have curled up in a ball and stayed there. The strength God has given me is the only thing that has kept me going. I could not have done this alone. ” I would have curled up in a ball and stayed there.” That’s what I always imagine happens when someone loses a child. Because of your thoughts and stories so many people know that it is possible to stand up again. Thank you for sharing part of yourself with others.